Back in January at CES I made a vow that I wouldn’t be reviewing Bluetooth speakers unless they truly had something to stand out from the crowd. There are so many of them on the market that it’s exceptionally easy for the good ones to get lost. The Jam, from HMDX, rises above by having decent sound but a great price point, so it’s time to dig in and tell you about it. 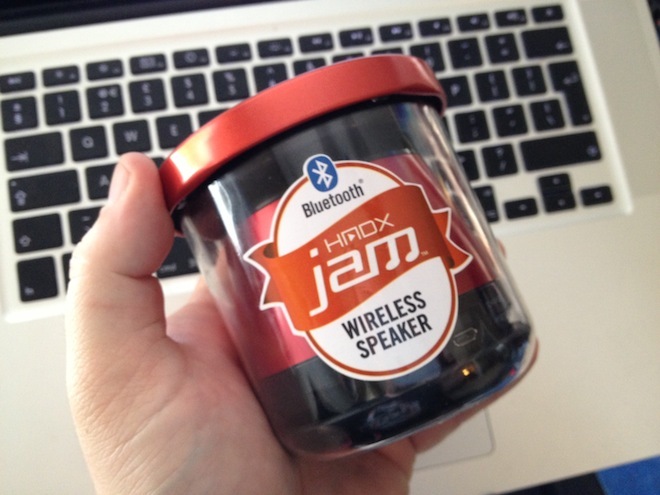 The first thing that you’ll notice about the Jam is the packaging. It looks like…a jar of jam. You see what they did there? Open up the jar and you’ll be greeted with a small device and a USB charging cord. There’s also a tiny manual with instructions for use, but nothing else. Pairing is simple, with a standard 0000 passcode. Once your device is paired, the Play/Pause and Volume +/- buttons along the bottom edge take control of everything else. Across the back (is there a “back” on a circular device?) you’ll find a line in jack for non-Bluetooth devices, as well as the micro-USB charging port. A full charge will give you around 4 hours of playback time at around 80% volume. Now let’s talk sound, because that’s the important part when it comes to any speaker. The Jam won’t blow you away with stellar audio quality, but it’s not really meant to. What it will do, however, is out-perform your laptop or internal phone speakers. It’s easily enough volume and quality to give you sufficient sound while you’re in a hotel room or maybe sitting at a picnic table in the park. So no, you’re not going to work the Jam into your home theater setup, but you’re also going to be OK with that fact because it’s incredibly cheap. You’ll find the Jam priced at $40, plus or minus a bit, depending on where you look. At that price, it’s a no-brainer to grab the Jam and toss it in your travel bag. Are there better sounding choices? You bet. Monster’s iClarity HD is still one of my favorites because of its size, and it includes a microphone. But it’s 2-3 times more expensive than the Jam. Ozaki’s O!music sounds incredible, but it’s four times the size and costs $150. So yeah, you can get something that sounds better, but it’s unlikely that you’ll find anything that sounds this good for the $40 price tag of the Jam.